So I am in trouble because Lydia called me Blobby Tail so I chased her and we had a fight. And I, like, won because I am much more muscular and am not a little squally girlie cat! The lady said my punishment is I don't get to do my usual Tuesday blog because I have been bad, but I have NOT been bad! She called me "Blobby Tail" so she deserved for me to bite her neck! I do NOT have a blobby tail! Anyway because I am being punished I have to post more of stupid Lydia's lame so-called portfolio. I said I already posted it last time but then it turns out there are even more dumb pictures of Lydia posing like she is some kind of fugly statue. You will hate them! But the lady says that if I am good tonight she might let me post something tomorrow. So, like, there will be something GOOD to read tomorrow. I will write another poem about how much I hate Lydia! I call this one "Portrait of a Diva." It's totally a diva pose. You can see that I am in my room, sitting on my rug, next to my scratching pad, and my tower! In other words, everything you see is mine! (In the real world I have to share with Flat Cat and Sam). My pose is cute but, like, menacing at the same time because you dare not mess with the Diva! It was my idea to look haughtily off to the side because even though in this picture I am, like, a rich diva, I am also a sensitive artiste who doesn't care about material possessions! The man who lives with me says this painting looks like a blurry photograph. He is not an artiste and therefore cannot appreciate a cool brushnstroke effect like this! I hope you can see this photo for the innovation that it is! Hi. Thanks for visiting my blog. Oh dear. Cat fights over a Blobby Tail? We think Blobby Tail is cute and unique! Lydia, I am very impressed with your artistic portrait. Silly humans sometimes can't appreciate art. I do not think your tail is blobby. I like your tail. Nice painting :) Thanks for visiting my blog today, Lydia! Hah ! Another tail tale ! I think I will become tail paranoiac and see tails everywhere (hope not in the swimming pool) but even if your tail is just a little short, you don't have a blobby tail ! Look at Arthur he now has a floppy tail ! What about a blobby and floppy picture ? PS the comments on Arthur's tail are so funny I am laughing all the time when I get a new one. One friend wrote, she hoped that Arthur has not to be de-tailed ! I can see your artistic flare! 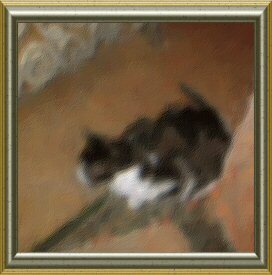 We do a lot of those painting photographs especially when the picture is blury. Sorry, but I don´t know what "blobby" means.Don´t found this word in my dictionnary, but I think your tail is nice. Great, these artistic painting !!! My cats are jealous of how eloquent you are at expressing yourselves, Flat Cat and Lydia (yes, both of you). They also think your tail is handsome, Flat Cat -- it was nice of you to display it so that Lydia could let us see it. My Socks and Silver and Stevie get in fights at various times, although not all three of once, just two at a time. They haven't yet let me know just what they are arguing about, though. Maybe they will follow your example so I will understand what all the hissing and growling is about. I think it is a wonderful tail! Wow! Your very own cat-club blog now! Impressive--even if they fight! Love the name Blobby Tail...it has a certain 'je ne sais quoi' to it that not even the Diva can deny! Happy COT! So Sam, you are silent... are you the Siamese of the bunch... Siamese aren't supposed to be quiet... They certainly aren't here. Actually all the cats here act like Siamese, even the Ragdolls except they are big and fat and fluffy and sometimes it is hard to tell which end is the head and which is the tail and that can be dangerous at times. 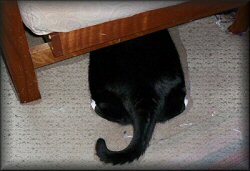 Flat Cat - your tail does not look "blobby" to me. Maybe Lydia needs a "time-out!"